September 28, 2010  As the U.S. military cracks down on insurgent groups in Afghanistan, survivors are fleeing to safe havens across the border in Pakistan, where they regroup. U.S. officials say winning the war will include ramping up drone strikes to destroy those sanctuaries. September 23, 2010  The debate over "don't ask, don't tell," the controversial policy banning gays and lesbians from serving openly in the military, moves from Congress to a court Thursday. The Obama administration is expected to ask a federal judge in California to refrain from issuing an injunction in a case there. Gay rights advocates are hoping the judge issues an injunction requiring the military to stop enforcing the policy. September 18, 2010  U.S. drone attacks along the Pakistan-Afghanistan border have ramped up in the past few weeks. Over the years, drone strikes were typically run by the CIA and targeted terrorist leaders with al Qaeda and other groups. The more recent attacks may indicate a new, more robust military strategy directed at the Taliban: a sign that drone strikes have been more fully integrated into the overall counterinsurgency strategy in Afghanistan. September 7, 2010  In the years after the U.S. invasion, a steady stream of Afghans living abroad came home to help rebuild their country. Then, security started to get worse. There were more suicide attacks and a general feeling of unease. Now, many Afghans living abroad wonder: Is it worth it? Can Iraq Lessons Learned Work In Afghanistan? September 2, 2010  As the combat mission ends in Iraq, 30,000 additional troops are heading to Afghanistan. Comparisons between the two wars are inevitable. Gen. David Petraeus, who commanded U.S. forces in Iraq, brings to Afghanistan many familiar military faces and the strategy of creating local forces to take control of security at the grass-roots level. August 30, 2010  Gen. David Petraeus makes fighting corruption a fundamental part of his strategy to turn Afghanistan around. But while he warns his troops about striking financial deals with potentially unreliable allies, the CIA is prosecuting its part of this war by doing exactly that. August 22, 2010  Since the fall of the Taliban in Afghanistan in 2001, the situation for women there has improved marginally. Repression continues, especially in the rural areas. August 22, 2010  Guest host Rachel Martin returned to Afghanistan last week for the first time since 2006. What definitely hasn't changed, she says, is how hard it is to get around the country. August 17, 2010  The U.S. and NATO have spent billions of dollars training Afghan security forces, and they say getting these forces up to snuff is the key to winning the war and drawing down U.S. forces. So needless to say, they were upset when they found out that some Afghans have been getting the training and then going to work for private security contractors -- who are often on Afghan government or Pentagon contracts. The contractors lure them in with higher pay and benefits. 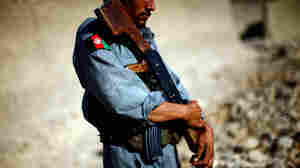 U.S. military officials in Afghanistan are working with the Afghan government to try to fix the problem. They're working to curb the work of private contractors in the country, and mandating that Afghans who are trained as part of the government security force must serve as a part of it. August 16, 2010  Defense Secretary Robert Gates says he will be stepping down next year. In an interview with Foreign Policy magazine, Gates said he would retire after President Obama completes the administration's Afghanistan policy review. The speculation already has begun about who will replace Gates. August 13, 2010  In northern Afghanistan, a tomato sauce factory is one sign that progress is being made and that locals are living semi-normal lives. But all isn't quite normal: It took eight armored vehicles to bring visitors safely to the factory this week.